Welcome to the world of Terabytes and Ultra-Fidelity. Gone are the days of mp3, CD, SACD and DVD-A. The only thing that seems to count today is vinyl and high-resolution computer audio. As the proud owner of an Altmann Attraction DAC you are entitled to the highest fidelity available using a simple computer audio system. With an Altmann Creation ADC in your setup, you are not at all far away from making the world's finest recordings. While many audiophiles get completely lost in details of driver-installations, network-setups, USB hacks and firewire dropouts - while still obtaining only mediocre performance - I feel compelled to step in for some assistance. Let's start with the first two: connection and current. As you may already know, the Attraction DAC has been designed from the very core to be powered by a Optima Red Top battery. It runs from ultra-pure current. The complete construction is set out to eliminate any noise contribution from digital switching. It has the world's smallest digital section consisting of only about 70 flip-flops, in order to keep the supply current clean. On the other side - The Computer - gigantillions of flip-flops, switching power supplies, hard-drives, power-soaking RAMs, video, noise only. Now, how to get those 2 things Purity and Noise together, without creating a mess ? Toslink: Your Worst Enemy or Your Best Friend ? Now, Toslink has a gained some bad reputation among hifi enthusiasts, who claim that with their equipment an RCA connection invariably results in a superior sound quality compared to a Toslink connection. The reason for this preference on RCA comes from the fact that the DAC devices they were using, were inable to cope with the Toslink's intrinsic jitter. 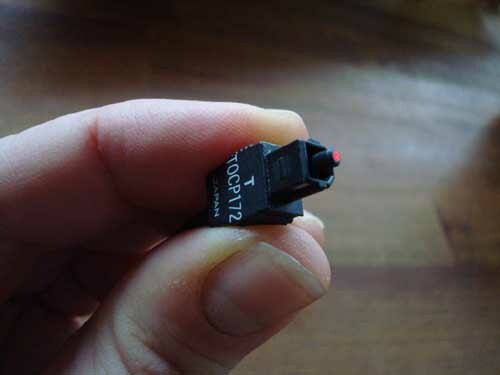 Yes, a Toslink connection generates a certain amount of jitter, however this type of jitter poses absolutely no problem to the Ultra-Precision-Clock-Injection technology that is implemented into every Attraction DAC. This elimination of the Toslink jitter only leaves us with its benefit -> immunity to electrical noise. The Altmann Attraction DAC as well as the Creation ADC allow Toslink optical connection up to 192 kHz. An optical connection will keep the Attraction DAC absolutely unaffected by the computer's noise. Now does that mean that a Toslink connection is always better than a RCA connection ? No, but it means that with a Toslink connection you have circumvented a potential problem. I don't know your computer, I don't know where you live and how much noise you have on your wall-outlet. With the Attraction DAC and the BYOB amplifier you have a system that will perform on the highest level whether you live in New York City or in the Himalayas, as there is no connection to the power grid, nor to the computer's power noise. 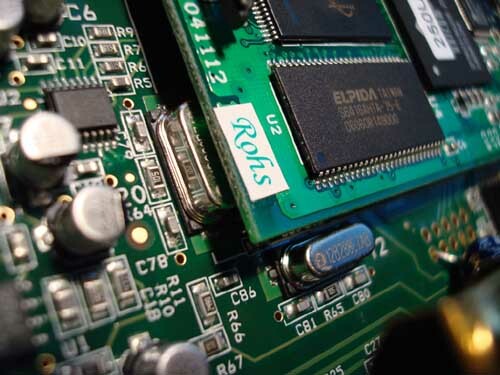 While some of today's computer manufacturers already supply 192kHz digital audio sulutions on their mainboards (using chips from Intel, Realtek, etc. ), those solutions do not operate on true audio clocks. A true audio clock is always a multiple of the original sample-rate. 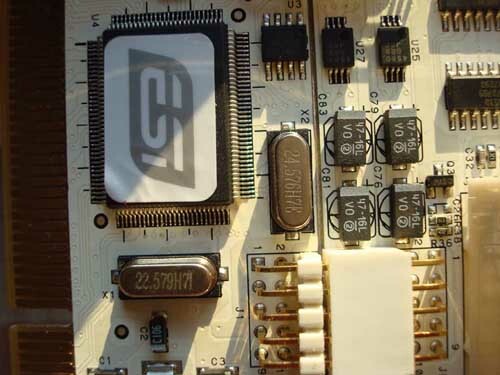 Finding true audio clocks on a board, is and indication the designer has knowledge on what is needed in order to attain the highest quality with digital audio. 22.579 MHz is a multiple of the 44100 / 88200 / 176400 Hz sample rates. 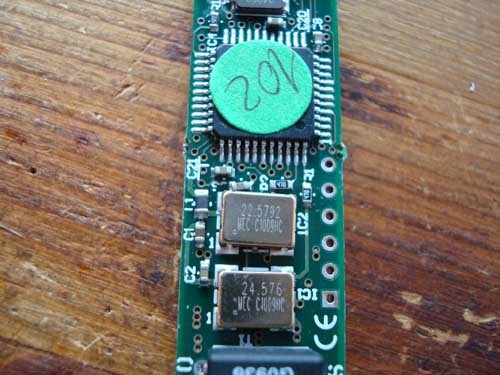 24.576 MHz is a multiple of the 48000 / 96000 / 192000 Hz sample rates. Shown here, the clocks of the Altmann Creation ADC, the same are used on the Attraction DAC. So, the combination of electric noise immunity (going optical to the Attraction DAC) as well as the use of true audio clocks does the complete trick for a high-performance computer audio setup. Packed with our knowledge about the 3 C's: Connection, Current and Clocks we can now set up our audio computer system. There are many possible ways, however I will only focus on a complete solution here: one that supplies the highest possible performance, is easy to setup, cost effective, works without any at 192kHz and is capable of recording your vinyl collection too. At 192kHz, the air gets increasingly thin for solutions that are based on external interfaces running either on USB, firewire or network. I know there are external devices available that may work well (i.e. RME fireface), however when all our requirements like 192kHz S/PDIF input and output, preferrable optical, and true audio clocks, an external solution will lose on cost-effectiveness. A much easier way is to set up a computer with a PCI audio card, such as the ESI Juli@. The Esi Juli@ card is available for a relatively low price, features true audio clocks and has a Toslink output, which is capable of 192kHz. It also has RCA S/PDIF input and output. 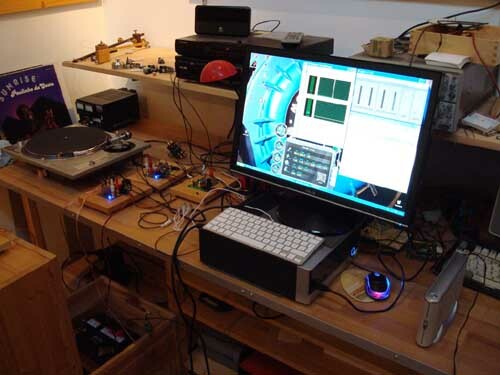 See below, the 192 kHz Audio Computer on the testbench. "Will the Attraction DAC become available with onboard Firewire or USB ? " 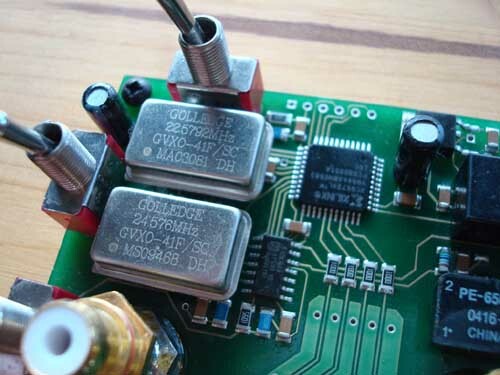 First firewire or USB integrated on a DAC will spoil the purity of the power supply. A Firewire (or USB) DAC's performance is limited right from the very start. It is limited by design. The Attraction DAC - fed by a good S/PDIF feed via Toslink - remains completely unaffected of the computer's power noise and its DA and analog sections are running on ultra-pure battery current, totally disconnected from the computer and power grid. 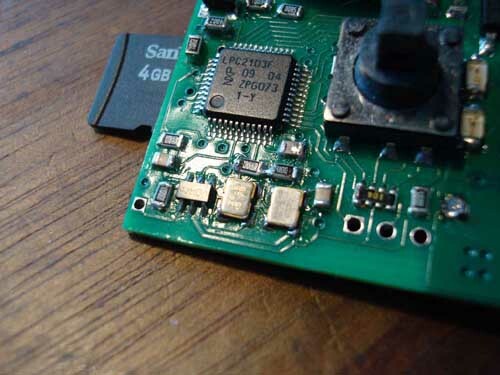 This simple mechanism effectively avoids the limitations inherent in all Firewire and USB-DAC-implementations, and therefore is able to deliver superior sound quality. Second, I suspect that firewire and USB will not be available anymore on computers in the near future, which will leave integrated firewire and USB DACs obsolete. The Altmann Attraction DAC relies on its S/PDIF inputs via RCA or Toslnk interconnects. The S/PDIF format is a streaming format especially designed for transmitting music and nothing else. S/PDIF has been in use for about 30 years now, and it will still be in use, when USB and firewire have long disappeared.